Like any relationship, the key to succeeding with your spaceship in Lovers in a Dangerous Spacetime comes with a healthy dose of communication. Sometimes it’s a simple, “How are you doing?” Sometimes it’s an, “Oh my god, what is that? Run!” Whatever the case–Always. Be. Communicating. But what’s that you say? You find that you and your partner have been “communicating” until your voice has gone hoarse, and yet it still feels like your spaceship is cracking at the seams? Luckily we’ve come up with a few hot tips to take your relation(space)ship to the next level. There are many self styled captains out there who never want to leave their comfy captain’s chair. Meanwhile their partner is being run ragged trying to cover 360 degrees of the ship by themselves. When things are heating up, make sure you jump up every now and then to stretch your legs and lend a hand. However, if you still insist on flying all the time, then it’s best to be smart about it. Use your mobility as an advantage by positioning the ship alongside terrain to prevent an attack from that angle. If you find yourselves out in open space and surrounded, try to find an escape route that puts all the attackers on one side of you, making them short work for a well placed Yamato Cannon burst. Like their piloting-obsessed partners, there are those players that cling to the Shield Station, desperately trying to stop every little bomb or bullet from hitting the ship. Meanwhile, more and more baddies keep accumulating. Because the shield deactivates whenever you move it, when surrounded it’s best to move the shield once to protect the ship from the biggest threats, then run to the other Turret Stations to thin out the enemy crowd. Many baddies shoot bombs or bullets that can be destroyed by your turret fire, so sometimes the best defence is a good offence. What’s that strange yellow object circling your ship? That, my friends, is the Yamato Cannon. Activate it by running to the yellow station and hitting the big button. Keep in mind the time it takes you to run across the ship to reach the button while the cannon circles into position, so you don’t overshoot your target. And don’t forget to upgrade this key station, as a well placed Metal or Power Gem can go a long way into boosting the effectiveness of the Yamato Cannon. 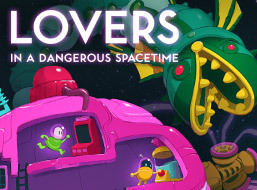 When playing Lovers in a Dangerous Spacetime 1-player, you have the choice to team up with an AI-controlled space-dog named Doppler or a space-cat named Kepler. Like working with any good partner, it’s best to play to their strengths. Because your furry friend is four-legged, they are able to run around the ship at a much quicker pace than you. So if a station needs attention, or an enemy needs a blast of Yamato fire, it’s often quickest to send your pet there first. Finally, if you find yourself getting too hot and heavy with the forces of Anti-Love, you can always take some pressure off by switching to Casual difficulty. This mode boosts your health and brings the enemy count down a notch. You’ll still be kept on your toes though, so there’s no shame in Casual play!